← Universal Healthcare – Can it happen here? Is the Media Realizing that McCain Is No Longer the Maverick? The so-called mainstream media is obviously conflicted about John McCain. It seems that the shelf-life of the barbeque is coming to an end. The rose-colored glasses are starting to crack. The Los Angeles Times posted a story yesterday ‘Between a maverick and a hard place’ where they appeared to be waking up to the fact that McCain really isn’t the maverick that his reputation would lead you to believe. I find this article interesting because it represents the media’s desire to maintain that belief that McCain still holds this image. For each fact they provide, they respond with the false perceptions. I suspect that old habits die hard or maybe it’s similar to when you realize a friend isn’t who he or she appears, you want to continue to give him the benefit of the doubt. The fact is most of us have been aware of McCain’s un-maverick style for a while now even while the media continued to paint him as this moderate Washington outsider who was the friendly, personable common man. The key word in that sentence is ‘image.’ McCain may have been ‘the outsider’ prior to 2000, but after Bush took office that was off the table. For some reason, this article only identifies the McCain shift since he decided to run for president in 2007. Authors Nicholas Riccardi and Maeve Reston spend a good portion of the article listing the areas where McCain broke from the party and used quotes to falsely represent that McCain still can be classified as a maverick. I think they have identified every issue where McCain and Bush have differed over the last 8 years. They mention: ‘campaign finance reform, tobacco regulation and the early Iraq strategy.’ What they don’t mention is McCain isn’t observing those campaign finance rules for this presidential run and he has fully supported the Iraq War and didn’t disagree with the strategy until after it was identified that the Bush strategy was off-the-mark. Amazingly, they reiterated these 3 differences from Bush later in the article. When you don’t have much material to work with, you have to hope no once notices the repetition. The fact is, McCain had ‘embraced party dogma’ pretty much since 2000. “The campaign has also undercut McCain’s image as a straight-talker by dramatically limiting the national media’s access to the candidate, who once charmed reporters and voters alike with his easy, free-wheeling, common-man conversational style on his campaign bus,” the article says. The reason McCain’s access to the media has been cut is quite simple. McCain has appeared flustered, often making misstatements and has spoken off message. Who can forget the squirming when McCain was asked why birth control was not covered by insurance? The goof reel really reduced in recent weeks quite probably because of the reduced access. But this insistence to repeatedly address the areas where McCain differs from Bush is frankly frustrating. “He can point to areas where he broke with the Bush administration, where he broke with his own party,” said Charles H. Franklin, a political science professor at the University of Wisconsin. They conclude with the stance that McCain changed his positions only after determining he was running for president in 2008. “A maverick doesn’t mean you’re always against your party,” said Julian Zelizer, a history professor at Princeton University. Does a maverick mean that you only break from your party 5% of the time over an 8 year period? If the authors and Mr. Welch are correct and McCain only made this calculated decision in 2005, what does that say about most of his stances from 2001-2005? Maybe over McCain’s first 2 decades in office this may have been true, but over the last 8 years, it is clearly false. This entry was posted in Barack Obama, Election 2008, John McCain, Politics and tagged Maverick. Bookmark the permalink. Thanks for posting this. It’s time all his supporters who think he’s a “maverick” wake up and smell the coffee. He’s a maverick like Bush is a maverick. P.S. love the movie poster. too funny. and true. I am sick of hearing that McCain is a maverick or that he’s moderate. He’s neither. His record proves that he is a true Republican down the party line. I thought the poster was great – even better since I mention Abramoff in the post. I wonder if we’ll be hearing more of Ms. Iseman. This is an excellent post. 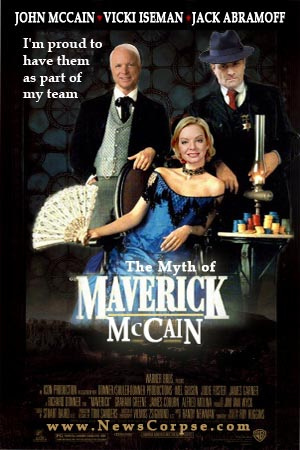 You’re correct, of course; McCain is no maverick. Keep pointing it out. I will as well. We have to keep this out there. Everything I read substantiates the fact that he is a true Republican. McCain sold his soul just so he could be the Republican nominee for president. How sad. He is a desperate man. That is actually a great description. He would have actually had a better chance of winning had he actually been and stayed the maverick and ran a clean campaign.